Impressively Formed in Triple Layered Chrome! includes a four piece set that fits over the driver and passenger door's mouldings both front and back. Ford side Styling accessory to the vehicle. Excellent Quality Triple Layer Chrome Plated, Precision engineering - Ready to Fix! Just look at the pictures to see the quality and the effect! Great way to make the side of your Ford Kuga stand out. Fast, simple installation via included automotive grade 3M adhesive tape. No special tools required to fit. No drilling or cutting required. Plated with three layers of chrome and easy to maintain. Contoured to the shape of the original side mouldings/streamers. Manufactured to perfectly match the OEM chrome on other parts of Ford Kuga. Will only fit Kuga Model 2012-on. Vehicle Surface must be thoroughly cleaned before fixing using our special primer wipe (Supplied in box). *If in doubt feel free to call our Sales Team who will be more than hapy to assist. *To maintain high quality finish regular cleaning & polishing is recommended, especially when exposed to road salt. 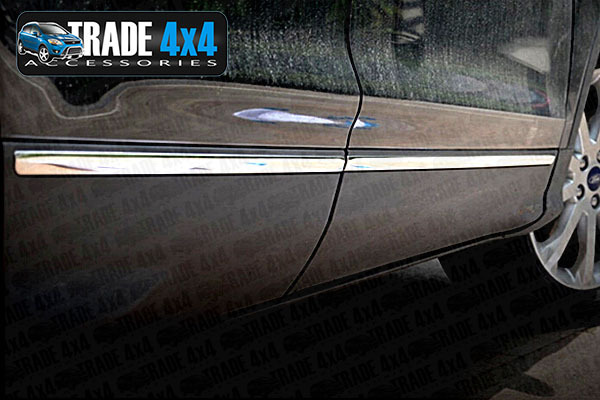 Click the button below to add the Ford Kuga Chrome Side Mouldings Streamer Cover Trim 2012-on to your wish list.